One of the things I have been working on over the past few months is getting out of my comfort zone more. Sometimes it can be so easy to get into a rut and stick with the habits you have. While habits can be a good thing, if your habit is doing the exact same thing night after night then you aren’t challenging yourself enough. I think I have mentioned it before on here, but I love Yes Theory on Youtube. Their whole concept is getting out of their comfort zone and doing somethings that are crazy and big and some things that are smaller but still make them seek discomfort. 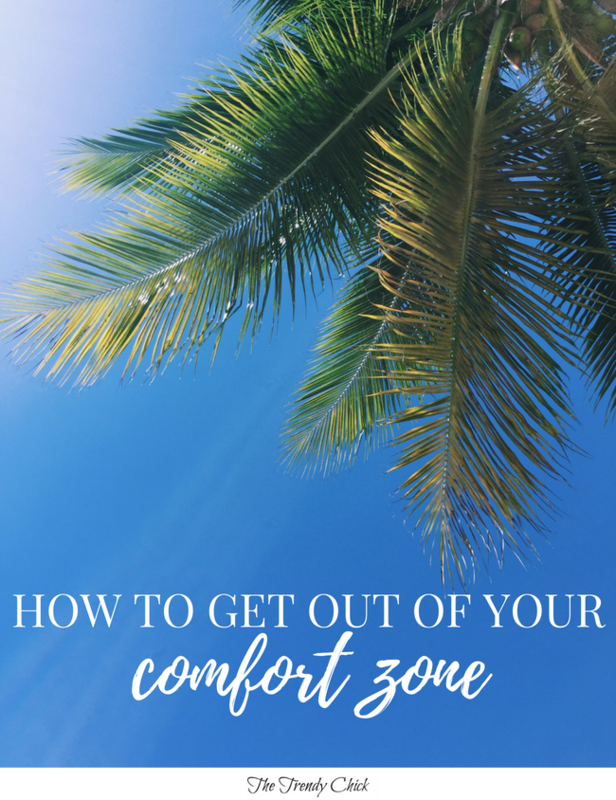 Today I wanted to put together my own list of things to give you some ideas for how to get out of your comfort zone even if you cannot drop everything and fly to Europe for a week. We all need to challenge ourselves from time to time because great things never come from comfort zones! Whether it is a day, week, or month, you will be challenged to find something else to do instead of posting and scrolling! It can also become an easy way to ignore people when you are out, so by not having that option I can guarantee you will be challenged! If you want to take it a step further, challenge yourself to not use your phone for a day. If you’re really feeling it, stay off computers and TVs too! Going new places in general will get you out of your comfort zone, but trying a new restaurant will help! Even just by choosing a different coffee shop in the morning you will switch up your routine! Never played piano? Why not learn a song! Want to paint a picture? Attempt it, even if you think it will turn out bad! You never know what you might end up loving, and it is really fun to try new things even if you aren’t good at first. If you don’t want to teach yourself a new skill, consider signing up for a class! Cooking classes or art classes are always fun choices. It can be so easy to make the same foods week after week because you know it tastes good and you won’t mess up the recipe. But try adding in a new recipe every week or two! Some might end up being gross or you might accidentally make it wrong, but you will learn some delicious recipes in the process! This might sound super simple to some people, but if you’re like me you might like to have a friend to go to the gym with, go shopping with, or eat out with. Try doing something that you normally do with a friend by yourself! Spending time with yourself and doing things you want to do is important too. What about that new trend you have been seeing around but have been too scared to try yourself? Why not just try it out for a day and see how you like it? Who cares if people you don’t know judge you as long as you feel confident and like it! This could mean flying to a new country or just driving 30 minutes to an ice cream stand a few towns over. There are so many possibilities, but going new places allows you to broaden your horizons and meet new people. I am pretty sure most of us have something we want to do but have been too scared to pursue. One quote I love is that “your largest fear carries your greatest growth.” This could end up being an amazing part of your story, but you have to have the courage to step out and get it started. For me, blogging every day for a month like I have been doing in July was a scary thing because it was something that I could fail at if I didn’t work hard. But it has also been a great season of growth for me because it has challenged me to get more creative and write a lot more often! How do you get out of your comfort zone? Let me know in the comments!